"Thanks to the program ‘Brazil Scientific Mobility Program’ today I have the opportunity to be studying on the other side of the world from Brazil and in one of Australia’s finest universities”. “This trip has allowed me to come in contact with other cultures from around the world. I have friends from England, Germany, Belgium, Chile and Spain! It is interesting to see how the integration of mixed habits and customs takes place”. “I'm really enjoying my studies at Monash University, one of Australia's largest universities”. “Melbourne is an amazing city. Visually very different from any Brazilian city I have visited”. 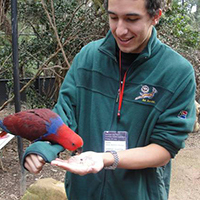 Read Celso Santos’s experience of the Brazil Scientific Mobility Program at Monash.